Hodgson's Petrogeny – Mithraeum. Our Common Sun. Stone relief found "between two altars (CIMRM 863, 864) about 0.66 before the back wall" (Hodgson). The lower part has not been worked and is rough. 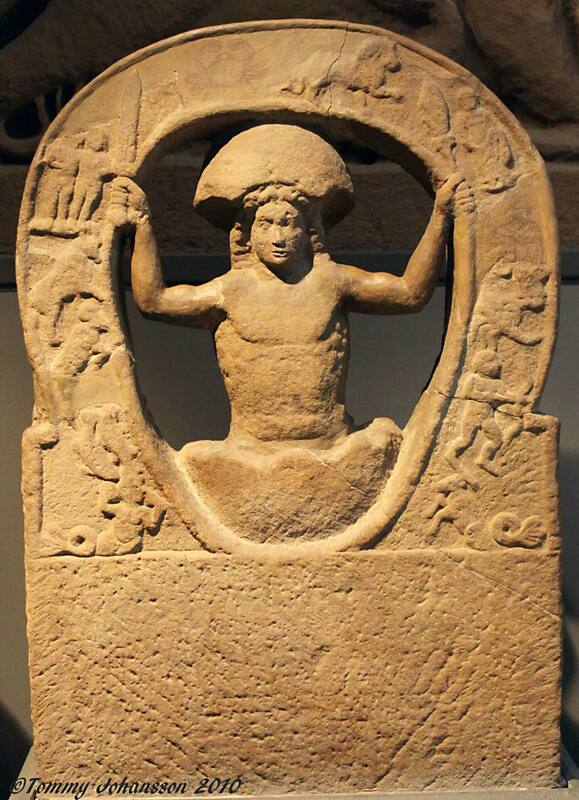 Above it in an open oval circle, the torso of a young naked Mithras with long curly hair, emerging from a egg, the two halfs of which are visible above the head and below the hips. The raised arms have got lost, but his hands, in which a dagger (r) and a torch (l) have been preserved on the rim of the circle. This part is framed by a rim on which the signs of the Zodiac: Aquarius-Pisces-Taurus-Gemini(lost)-Cnacer and Leo-Virgo-Libra(lost)-Scorpio-Sagittarius-Capricornius.